Why should I book an Escorted Tour? Escorted motorhome tours are the perfect way to experience the freedom your motorhome offers you, but with the support of experienced Tour Director’s. We have made all the arrangements in advance, so you have no planning worries. Our comprehensive tour pack will be sent to you around 6 weeks before the start of your tour and supply you with essential travel information, all campsite details, maps & GPS co-ordinates. We offer a clear, organised itinerary with excursions, group meals and free time all built-in so that you can enjoy the company of like minded people as you discover new and interesting places on your holiday. Who will be the Tour Directors for my tour? We are fortunate to have a great team of Tour Directors who are all very experienced and passionate about leading group motorhome tours, each tour is lead by a couple in their own motorhome who are with you from start to finish. At the start of each year our tours are agreed with each Tour Director, whilst we anticipate this to stay the same it could be in exceptional circumstances changed. Most notable if the Tour Directors are unable to take the tour due to personal circumstances, another set of Tour Directors would take charge of the tour. Being a team rather than a ‘single couple’ allows us to provide this assurance and guarantees your tour continues. When should I book a tour? Our tours are thankfully very popular with peak booking time being the summer and autumn of the year before the tour runs. Our tours can easily start to become sold out well before Christmas so it’s better to book as soon as you’ve decided which tour(s) you would like to join, with most tours having a limit of 15 guest motorhomes. When you book you do so in confidence of knowing your tour will never be available cheaper than the price you pay; we guarantee the price you pay is the lowest the tour will ever be offered for. What happens if the tour of my choice is full? We have a reserve list for each tour, so if you would like we can hold your details and should a place become available due to cancellation we will contact you. Yes. GB Motorhome Tours complies with all the 1992 Package Tours Regulations in particular all money paid by you is secured. To provide this security, until your tour is completed, all your money is held in a customer trust account with HSBC in the UK, giving you total peace of mind that from the payment of your deposit through to the completion of your holiday your money is safe. Are the tours fully escorted? All tours are fully escorted for the duration as stated in the itinerary. Some begin in the UK and return to Calais port, but most will commence and terminate at various locations in Europe with options to start in the UK. Starting in the UK is a particular benefit we offer and can be very reassuring if you have not ventured onto the continent much previously or wish to have everything organised for you. At the end of the tour, our Tour Director’s may be returning to the UK, if so they will do so by a route and timing of their choice in which case you may accompany them if you wish. If you choose to do this you do so at your own cost as the company’s liability ends on the date and at the place stated in the itinerary. Do the tours include excursions and events of interest? Yes, our tours are very much more than just taking you to a campsite and leaving you there. On average 50% of time at each campsite is used for excursions put together personally by our Tour Directors whilst researching every aspect of the tour. These are arranged to a very high standard and will include everything to make sightseeing easy. We arrange the transport, local tour guides and cover entrance fees. There is no thinking ‘I would love to see …. but getting there from the campsite without taking my motorhome is difficult’, our transport mostly collects and returns us to the campsite. You will not miss the best places to see and you’ll benefit from having a knowledgeable local guide included on most excursions. Many tours also include special events of interest, often all or part of these events are not generally available to the public but arranged especially for our group. How many motorhomes can I expect on my tour? Group sizes are typically between 10 and 15 motorhomes. Are tour groups a mix of motorhomes and caravans? No our tours are designed for motorhomes, generally they move on quicker than suits caravans. Being specifically for motorhomes we take into account most motorhomers prefer not to move their van once pitched on site and do not have access to their own transport. We select campsites close to attractions, with good public transport links and arrange excursions with all transport included. Everything detailed in the itinerary ‘as included’, most notably all campsites, excursions & meals that form part of the itinerary; full tour pack containing all the information for travelling on the continent and tour programme including campsite directions, maps & GPS co-ordinates. Also throughout the tour the services of our Tour Directors and our UK based office team there to provide support should this be needed., This is particularly important should there be an instance whilst you are away which stops you from being able to be with the tour group and our Tour Directors. What is not included in the cost of my holiday? There are a number of items which are not included in the tour price, the most common being personal food and drinks other than that detailed as included in the itinerary, fuel for your motorhome, any activity that is designated as “optional” within the tour, motorway tolls, vignettes & inter-island ferries, plus all costs on your return journey to the UK from the stated end of the tour. Are cross channel ferry tickets included and what type of ticket will I get? Most of our tours start on the continent with an optional travel from the UK package. If the tour starts in the UK or you choose the optional travel from the UK package you will have included a Dover to Calais return ferry ticket. This is a P&O 60 day Flexible Ticket with Club Class Lounge included both ways. If you would like to travel via another P&O route, notably Hull to Rotterdam/Zeebrugge please contact us as we can substitute Dover to Calais for this at a supplement cost. If the tour starts on the continent and you book just the tour then no Dover/Calais ferries are included. Having the choice to start in the UK or on the continent gives you the flexibility to choose the best arrangements for you. What will the campsites be like? Across Europe the campsites vary, we always use the best campsites in the areas that we include on each tour. Please travel with an open mind and do not expect that everything will be the same as found in the UK. A major reason for travelling abroad is to see and experience something different. Electric hook-up are included for you at all campsites where these are available. You must take out travel insurance suitable for your needs, this should include cancellation cover and cover for any events you plan to arrange independently of the tour itinerary. We strongly advise that you also take out vehicle breakdown cover for the countries being visited on the tour. Please read our Terms & Conditions, item 5 details this fully. Our standard terms are; cancellation more than 56 days before tour start date lose of deposit, 56-30 days before tour start date 50% of total price, less than 30 days before tour start date 100% of total price. Providing cancellation was an item covered by your travel insurance then these costs would be recoverable. It is now much easier to take your pet into mainland Europe following the introduction of the Pet Passport scheme. Please advise us at the time of booking and we can tell you whether the tour is suitable or not. Further information can be obtained from www.gov.uk/take-pet-abroad. Please note pets may only be carried if responsible arrangements have been made for them whilst you attend group excursions/meals and you are in agreement with our pets policy. If you have a special request, for example dietary requirements, mobility etc., we will always do our best to help. Your personal needs will always be passed onto our suppliers who we will request to assist you, however we are unable to guarantee your needs can be accommodated at all times. Do I need any special equipment for driving in Europe? Not so much special but you must comply with the regulations of the countries being visited most notably you are required to carry a reflective jacket/waistcoat for each person travelling, warning triangles, headlamp deflectors & display a GB sticker. For specific country information visit any of the major motoring organisations websites for up to date information. 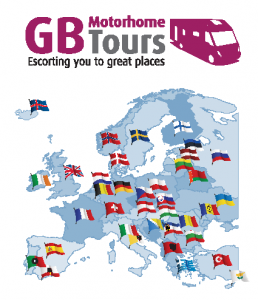 In summary what are the major benefits of a GB Motorhome Tours holiday? The following are customer comments on what they like about our tours.